Since 1993 Russia has always differentiated patent fees for residents and for nonresidents. However, in light of WTO accession, on September 15, 2011, the Russian government will equalize the patent fees for residents and nonresidents. At present patent fees for non-residents are four-five times the amount of fees for Russian citizens and local companies. For example, the official fee for registration of an invention, a utility model, an industrial design and for issuance of a patent for these objects is 10,800 rubles for nonresidents, while for residents it is only 2,400 rubles. On entry into the WTO the amounts of fees will be unified, whereupon in many positions they will increase by about 30% for Russian inventors and trademark owners, whereas for nonresidents they will decrease by more than 50%. In particular, the above mentioned procedure of registration will cost 3250 rubles. Registration of an application for a patent for invention for residents will go up from 1,200 rubles to 1,650 rubles. Annual fees for maintenance of a patent for invention or industrial design will increase by more than one third. The examination of a denotation claimed as a trademark will cost 11,500 rubles plus 2,050 rubles for each class of the International Classification of Goods and Services, for which registration is sought. At present, it is 8,500 rubles plus 1,500 rubles, respectively. A trademark registration will cost 16,200 rubles instead of 12,000 rubles stipulated now. The fee for issuance of a certificate of exclusive rights to the appellation of origin will rise in prise as well. Besides, according to the new patent fee regulations, a 15% discount is stipulated for registration of an application for an invention, a utility model and an industrial design, if the application is filed in electronic form. This also applies to fees for registration of an application for a trademark, a service mark and an appellation of origin. Certain fees associated with patenting of inventions and industrial designs will be reduced by 50% for small business entities. The amendments will come into force after Russia ratifies the accession agreement, supposedly in the middle of 2012. The draft Law "On introducing amendments into some legislative acts of the Republic of Kazakhstan on issues of intellectual property"
On December 14, 2011 at the plenary session of the Parliment Senate in the first and second readings there was approved the draft Law of the Republic of Kazakhstan "On making amendments into some legislative acts of the Republic of Kazakhstan on issues of intellectual property" that is aimed at bringing the legislation in the field of intellectual property rights in compliance with international standards, protection of copyright and related rights on the Internet, minimization of reference rules, elimination of administrative barriers, contradictions, conflicts and gaps. On January 1, 2012 shall come into force the new edition of the international classifications: the 10th edition of International Classification of Goods and Services (The Nice Classification - ICGS -10) and 2012.01 edition of the International Patent Classification (IPC 2012.01). The texts of the new editions of the international classifications can be found on the web site of the World Intellectual Property Organization (ICGS, IPC) in English and French. As has been reported earlier the Law of May 17, 2011 № 262-3 “On copyright and related rights” was adoted as part of the state policy on protection of intellectual property in the Republic of Belarus, for the purpose of legal regulation of relations in the creation and use of scientific works, works of literature and the arts, performances, phonograms, programmes of broadcasting and cablecasting organizations, as well as to improve the protection of rights and legitimate interests of authors, performers and other entities that have copyrights and related rights to the results of creative activity. The Law contains a new Chapter 4 "The cases of free use of copyright and related rights" which regulates the use of copyright and related rights without the consent of authors or other owners and without paying copyright royalties. Article 37 relates to free use of literary works by libraries and archives. According to the Article a library can carry out reproduction of lawfully published works without a profit for acquisition of library collections, replacing originals or copies of works that were lost, destroyed or made unusable. "Electronic copies of literary works provided by libraries for temporary free use, as well as reciprocal use of library resources, are available only in the premises of libraries by using local computer networks and remote access, provided that technical means are used for protection of copyright or related rights, excluding the possibility for users to create full copies of the works on paper or in electronic form". A new version of the Law of the Republic of Belarus "On copyright and related rights" is to come into force on December 1, 2011. The Ukrainian registrar of Internet domains “Hostmaster” plans to make an apostrophe an authorized sign of domain names. The apostrophe is a very important character in the Ukrainian language – a large percentage of Ukrainian words contains an apostrophe. However, a symbol that is commonly used to refer to an apostrophe (inverted comma in the English keyboard layout) is prohibited for use in domain names. According to the “Hostmaster”, the necessity to introduce an apostrophe in the domain names in Ukraine has been discussed since last year, but now the decision has been taken. As an experiment, the company has recently launched three domain names containing an apostrophe: ’.ua, м’ясо.kh.ua and зв’язок-є.kh.ua. According to those managing the experiment, an attempt was quite successful: these domains function properly. So now the “Hosmaster” in cooperation with other registrars will develop a scheme, which can be used by anyone. “The experience can be considered a success – all the domain names function properly, and, moreover, a test site has been posted on the domain м’ясо.kh.ua. Now the “Hosmaster” is ready to collaborate with domain registrars to work out amendments into the regulations that will permit delegation of the domains with an apostrophe to the public” – commented the “Hosmaster”. The Director General of the World Intellectual Property Organization (WIPO) presents his compliments to the Minister for Foreign Affairs and has the honor to notify the deposit by the Government of the Republic of Lithuania, on November 3, 2011, of its instrument of accession to the Patent Law Treaty, adopted in Geneva, on June 1, 2000. The said Treaty shall enter into force in the Republic of Lithuania on February 3, 2012. There are 29 contracting parties of the Patent Law Treaty now. - reinstatement of an applicant’s or patent owner’s application rights or patent-related rights. The amendments of Law on Fees for the Registration of Industrial Property Objects No. XI-1262 enter into force on February 3, 2012, as well. The following new fees are included: correction or addition of priority claim, restoration of priority right, continued processing of patent application, reinstatement of rights. The deputies of the Legislative Chamber (Oliy Mazhlis) have considered in the first reading the submitted draft law "On introducing amendments and additions to some legislative acts of Uzbekistan in connection with improvement of intellectual property legislation". Amendments will be introduced into the laws "On legal protection of software for computers and databases", "On inventions, utility models and industrial designs", "On selection achievements", "On legal protection of topographies of integrated circuits", "On trademarks, service marks and appellations of origin", as well as to the Civil Code and the Tax Code of the Republic of Uzbekistan. The Law has been drafted pursuant to the Resolution of the President of the Republic of Uzbekistan dated May 24, 2011 "On establishing the Intellectual Property Agency of the Republic of Uzbekistan". Enactment of the Law will ensure unification and uniform application of legal provisions and terminology in the field of intellectual property, and will expand the ways to protect the rights of holders of intellectual property objects. Upon discussion the deputies approved the main provisions of the Law and adopted it in the first reading. The Executive Committee has been assigned to prepare a draft of the Law for consideration in the second reading taking into account the proposals made during the discussion. Director General of the World Intellectual Property Organization, Francis Gurry, reported about the accession of the Republic of Kazakhstan to the Patent Law Treaty. The Treaty will enter into force for the Republic of Kazakhstan on October 19, 2011. The Coordination Center of the .RU domain zone together with the “Internet Technical Center” and the statistical service Openstat announced about the launch of a new project "Domains of Russia" available at статистикадоменов.рф and statdom.ru. The latter-day resource contains daily updated statistics covering all aspects of the development of Russian domain space. In addition to the domain statistics the site "Domains of Russia" also presents analytical materials and data on the servers serving the sites of the domain zone .RU and .RF, and the operating systems installed on the servers. The main sources of statistical data presented in the resource are the main domain registry .RU and .RF, the data of the web crawler, which scans websites by domains from the registers and specialized counters of the Openstat service. The data from the register is daily processed by technical means of Openstat for making reports, graphs and charts. In August 2011 Russia's national top-level domain .RU got ahead of the domains of the European Union (.EU) and China (.CN) and is now in the fourth place among national domains after such top-ranked leaders as the national domains of Germany .DE (14,572,913 domain names), the United Kingdom .UK (9627873 domain name) and the Netherlands .NL (4,641,578 domain names). The total number of .RU domains registered in August is 3,412,266. In August the .RU domain also showed one of the highest growth rate among the 10 largest national domains in relative and absolute sense. Meanwhile, Russia's leading domain registrar RU-CENTER initiated the establishment of top-level domains “.москва” and “.moscow” specially for institutions and enterprises of the Russian capital. Thus, it will be possible to create sites with addresses like www.museum.moscow, www.company.moscow, www.school.moscow, etc. The representatives of the RU-CENTER are sure that such move will be beneficial and will contribute to the development of Russian business and tourism. In fact, over the last years initiative groups appeared in several countries that seek to create their own domain names for other cities - London, New York, Hamburg, Berlin and Paris. The new approved Regulations on fees for inventions and industrial designs have been approved by the Decree of the President of Turkmenistan on July 29, 2011 № 11 764. According to the Decree the new amounts and type of fees for maintaining Eurasian patents in the territory of Turkmenistan have been established. In accordance with the decision taken at the twenty-first session of the Administrative Board, the EAPO starts to take in payments of fees in new amounts prescribed by a member-state starting from the date when the EAPO receives the official notification from the Plenipotentiary Representative of the member-state to establish (change) the type and/or amount of fees for maintenance of Eurasian patents in its territory. This notification has entered EAPO on August 29, 2011. The Turkmenistan Parliament has adopted a law "On Legal Protection of New Varieties of Plants". This is a completely new legislation, which is based on the provisions of international conventions and laws operating in Turkmenistan for legal protection of intellectual property. The law regulates creating, identifying, breeding, and using choice selections. With the adoption of the Law, Turkmenistan entered the list of countries that recognize and provide legal protection to scientific advances in crop and livestock related to intellectual property. The law introduces the concept in terminology, which is based on legal principles relating to the legal protection of selecting achievements in Turkmenistan, including basic concepts such as breeding achievements, the breeder, the variety, or breed, as well as auxiliary concepts, which reveal their contents. The new law introduces a 30-year protection of animal breeds and either 25- or 30-year protection of plant varieties depending on their kind. The law stipulates a preliminary examination and a substantive examination of an application for plant variety prior to the issuance of a patent, that is, in order to be registered, a variety should meet the requirements of novelty, homogeneity, stability and distinctiveness. The law also prescribes compulsory licenses for the registered varieties. The law "On Legal Protection of New Varieties of Plants" came into force in Turkmenistan on August 13, 2011. In accordance with Rule 35(2)(d) of the Common Regulations under the Madrid Agreement and Protocol, the Director General of the World Intellectual Property Organization (WIPO) has established the following new amounts, in Swiss francs, of the individual fee that is payable when Uzbekistan is designated in an international application, in a designation subsequent to an international registration or in respect of the renewal of an international registration. - for each additional class – 103. - for each additional class – 154. - for each additional class – 51. This change will take effect on September 18, 2011. In accordance with Rule 35(2)(d) of the Common Regulations under the Madrid Agreement and Protocol, the Director General of the World Intellectual Property Organization (WIPO) has established the following new amounts, in Swiss francs, of the individual fee that is payable when Turkmenistan is designated in an international application, in a designation subsequent to an international registration or in respect of the renewal of an international registration. - for each additional class – 86. In accordance with Rule 35(2)(d) of the Common Regulations under the Madrid Agreement and Protocol, the Director General of the World Intellectual Property Organization (WIPO) has established the following new amounts, in Swiss francs, of the individual fee that is payable when Ukraine is designated in an international application, in a designation subsequent to an international registration or in respect of the renewal of an international registration. On July 29, 2011 the new statute of fees on inventions, designs and trademarks was approved by the resolution of the Turkmen Government. The main change in the statute of fees relates to the change of currency in which the fees are settled. Namely, earlier the fees were fixed in American dollars (USD) and now they are fixed in Turkmen manatas (TMM). The amount of majority of fees has not changed or has changed only slightly. The new individual fee prescribed by the Hague Agreement for international industrial design applications designating Kyrgyzstan entered into force on August 1, 2011. - for each additional design CHF 64 (instead of earlier stipulated CHF 78). - for each additional design CHF 6 (instead of earlier stipulated CHF 8). The Kazakh Patent Office has introduced the online application filing system. For authorization it is necessary to complete THE REGISTRATION QUESTIONNAIRE . Upon successful completion of registration and logging on the web site of Kazakh Patent Office www.kazpatent.kz visitors have free access to the pages of "Electronic Payments", "State Register of protected documents of the Republic of Kazakhstan" and "E-filing of applications". The Estonian Internet Foundation has recently introduced domain names with diacritical marks. The actual registration of .ee domain names containing letters with diacritical marks was opened to all interested persons on a first-come, first-served basis from 13 June 2011. It is now possible to register domains containing six ‘new’ letters with diacritical marks: õ, ä, ö, ü,  and , which means that the .ee domain will be covered with the full range of the Estonian alphabet. Registration of domain names containing letters with diacritical marks is voluntary. Domain names containing letters with diacritical marks are registered for the same fee as common domain names. The fee is set for end consumers by the Registrar. As has been reported earlier, at the beginning of this year the Russian Patent Office has offered a new service – filing the application for registration of trade and service marks in the electronic form. Recently the Russian Patent Office has also launched a system for filing patent applications in the electronic form. Our company, Mikhailyuk, Sorokolat & Partners, which has already been successfully utilizing the software for electronic filing of trade and service mark applications, now also exploits the new system for electronic filing of patent applications. Among the benefits of these electronic filing systems are a speedy and a reliable way of filing applications, as well as reduced expenses due to minimization of paper consumption, mail and courier services etc. Uzbekistan's president Islam Karimov signed the decree and the Cabinet of Ministers signed the corresponding detailed enactment establishing the Agency for Intellectual Property of Uzbekistan. This newly formed Agency is established on the basis of the State Patent Office of the Republic of Uzbekistan and the Uzbek Republican Agency for Copyright. The Resolution defines the main tasks and activities of the Agency, establishes its organizational structure and the structure of the central office. One of the goals of the newly formed Agency is to ensure the implementation of the single state policy on protection of intellectual property. For this purpose the Agency created two divisions - the State Unitary Enterprise "Intelligence expert" and the training center for training and professional development of specialists in the area of intellectual property. The Republic of Tajikistan has acceded to the WIPO Performances and Phonograms Treaty on May 24, 2011. The WIPO Performances and Phonograms Treaty (WPPT) is an international treaty signed by the member states of the World Intellectual Property Organization, adopted in Geneva on December 20, 1996. WPPT was initiated with an objective to develop and maintain the protection of the rights of performers and producers of phonograms in a manner as effective and uniform as possible. The said Treaty will enter into force, with respect to the Republic of Tajikistan, on August 24, 2011. Referring to Article 8(7) of the Protocol the Government of Tajikistan has requested an individual fees, which are payable when Tajikistan is designated in an international application or in a designation subsequent to an international registration or in respect of the renewal of an international registration under the Madrid Protocol. – for each additional class – 14. The declaration concerning the new individual fees made by Tajikistan enters into force on June 30, 2011. The Government of Georgia has made a declaration to the Director General of the World Intellectual Property Organization (WIPO) changing the amounts of the individual fees payable when Georgia is designated in an international application or in a designation subsequent to an international registration or in respect of the renewal of an international registration under the Madrid Protocol. – for each additional class – 93. The new individual fees under the Madrid Protocol for international applications designating Georgia entered into force on June 1, 2011. The Law of the Republic of Belarus of May 17, 2011 No. 262-3 "On Copyright and Related Rights"
As part of the state policy on intellectual property protection in the Republic of Belarus there was adopted the Law of the Republic of Belarus of May 17, 2011 No. 262-3 "On Copyright and Related Rights". The law was adopted with the aim of legal regulation of social relations in the field of development and use of objects of copyright and related rights, increase of effectiveness of protection of the rights and legitimate interests of authors, performers and other entities that have copyrights on the results of creative activity. • the possibility of concluding the gratuitous contract on the transfer of rights to use, as well as the assignment of exclusive rights to works and objects of related rights. Taking into consideration the necessity for active involvement of intellectual property rights into civil circulation and for regulation of relations in the transfer of property rights the Law includes provisions on the author's contract, assignment agreements, license agreements, contracts of order. Some innovations that found reflection in the Law relate to audiovisual works, computer programs, the legal status of certain categories of artists (directors of plays), and other issues. Considerable attention within the Law is paid to the legal regulation of activity on collective management of property rights to works and objects of related rights in cases where their practical implementation on an individual basis is difficult. In general, the adoption of the Law is intended to improve the effectiveness of functioning of the system of copyright and related rights in the Republic of Belarus and seeks to promote the formation of auspicious environment for intellectual development of a person, stimulation of creative activity of national authors, meeting the needs of society access to the world of science, literature, art. As of May 16, 2011 the owners of domain name “.РФ” have the opportunity to voluntarily waive the right of ownership of the domain by submitting the corresponding written notice to the company RU-CENTER. In addition, as part of the changes, the company RU-CENTER reserves the right to abrogate the right of ownership of the domain name “.РФ” in case it violates the rights of owners of trademarks or trade names. Subsequent to the changes of terms for domain registration, the amendments to the annex to the Service Agreement are introduced. The Madrid Protocol regulates the international registration of marks and the Hague Agreement regulates the international registration of industrial designs. Both are administered by the World Intellectual Property Organization (WIPO). The Director General of the WIPO has established new amounts of the individual fees that are payable when the Republic of Moldova is designated in an international application, in a designation subsequent to international registration or in respect of the renewal of an international registration under the Madrid Protocol. New fees under the Madrid Protocol entered into force on May 28, 2011. Also new individual fees for registration of international designs under the Hague Agreement with respect to Moldova will enter into force on June 1, 2011. The Law is aimed at liberalization of the criminal legislation in the Russian Federation. Certain amendments are dealing with intellectual property infringement. 2. illegal use of a warning marking with respect to a trademark or an appellation of origin not registered in the Russian Federation, if such action is committed repeatedly or causes major damages. Prior to the amendments, the only sanction for the above-mentioned offences, if they were commited by a group of people acting in collusion or by an organized crime group, was imprisonment for up to six years with additional penalties. Under the new provisions, such actions, as an alternative for imprisonment, may be punished by a fine in the amount of from 500 000 rubles (equivalent to ~17710 USD or ~12500 EUR) to 1000 000 rubles (equivalent to ~35420 USD or ~25000 EUR) or in the amount of infringer’s salary or other income for the period of from three to five years. The 133rd INTA meeting took place in San Francisco, USA in May 14-18. 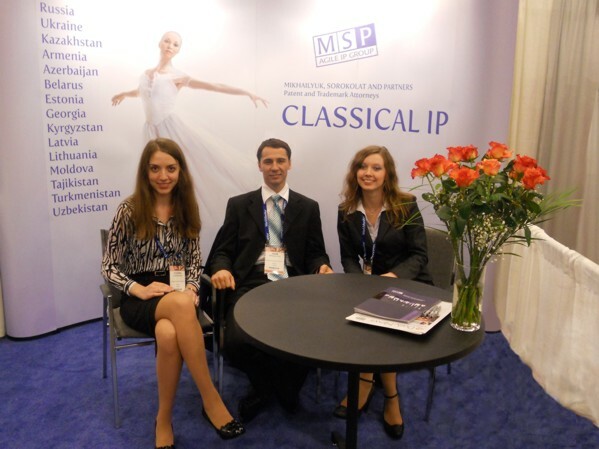 By tradition our company took part at the INTA exhibition introducing a new slogan "Classical IP", that embodies the idea of "classical" values of our company practice. - in accordance with Article 8(7)(a) of the Madrid Protocol in connection with each international registration in which the Republic of Tajikistan is mentioned and in connection with the renewal of any such international registration, for Tajikistan should be applied an individual fee instead of a share in the revenue produced by the supplementary and complementary fees. The Madrid Protocol will enter into force with respect to the Republic of Tajikistan on June 30, 2011. The law "On ratification of the Patent Law Treaty" has been passed by the Senate (upper house of parliament) of Kazakhstan. The Patent Law Treaty was adopted on June 1, 2000 in Geneva at the Conference of the World Intellectual Property Organization with the participation of more than 140 countries. The Treaty entered into force on January 1, 2006. Accession to the Treaty will give the right to provide benefits of unification and simplification of requirements for filing application documents. In addition, by eliminating the complicated patenting procedures, the Patent Office of Kazakhstan will be able to execute its functions more effectively and reduce its costs. The document is aimed at harmonization and simplification of the procedural rules for patenting executed by the patent offices of member states. The document also provides simplified requirements for applications for a patent and the procedures of obtaining and maintaining a patent. The provisions of the Treaty are applied to national and regional patent applications for inventions and additional patents that are filed in the Patent Office or for the Patent Office of the contracting party. Articles 5 and 6 of the Treaty stipulate the requirements for the application structure for obtaining a patent. The Treaty may be revised on a conference of contracting parties. The decision on convocation of any such conference is made by the Assembly, in which each member state is represented by one delegate. The President has signed the Law of the Republic of Kazakhstan "On ratification of the Patent Law Treaty". The text of the Law is in press. The AGEPI, the State Agency of Intellectual Property in the Republic of Moldova, is developing a number of regulatory documents on copyright and related rights. In order to implement the provisions of Law No. 139 dated July 2, 2010 on Copyright and Related Rights, which entered into force on January 1, 2011 the AGEPI is developing subordinate legislation, namely: regulations on registration of objects of copyright and related rights, the regulations on the commission for mediation and regulations on the collective management of copyright and related rights. The rates of remuneration of authors and copyright holders are also expected to be revised. Currently there exists the minimum tariff of remuneration approved by the Government Resolution No. 641 of July 12, 2001. Ukraine has successfully passed the second stage in the process of obtaining a non-Latin country code top-level domain .укр (ukr) and is now awaiting the final step in the process – the domain delegation. According to the rules of ICANN (The Internet Corporation for Assigned Names and Numbers), the registration of top-level domain names consisting of non-Latin alphabet letters includes three stages. At the first stage, a country prepares all the necessary documents, determines the domain operator (in Ukraine it is the Ukrainian Network Information Center, established by the Cabinet of Ministers and headed by Yuriy Goncharuk) and submits the request to ICANN. At the second stage, the domain name is verified to meet a specific set of linguistic and technical requirements stipulated by the ICANN’s IDN (Internationalized Domain Name) ccTLD Fast Track String Evaluation. The third stage is launching the domain name. At present in Ukraine there are Cyrillic domains of IDN (Internationalized Domain Names) system. They consist of words written in letters of national alphabet, but the right part of the domain address should be written in Latin – com.ua or kiev.ua. On March 4, 2011 WIPO launched a new on-line tool that is aimed at simplifying search over 640,000 records relating to internationally protected trademarks, appellations of origin and armorial bearings, flags and other state emblems as well as the names, abbreviations and emblems of intergovernmental organizations. The Global Brand Database offers free of charge, simultaneous brand-related searches across multiple collections. At present, the Global Brand Database search interface allows users to access three WIPO databases – international trademarks registered under the Madrid system for the international registration of marks; appellations of origin registered under the Lisbon system for the international registration of appellations of origin; and armorial bearings, flags and other state emblems as well as the names, abbreviations and emblems of intergovernmental organizations protected under Article 6ter of the Paris Convention for the Protection of Industrial Property – by means of one simple, user-friendly screen. The Global Brand Database is designed on the basis of existing search resources related to brands by providing a single gateway for searching multiple sources. A novelty is the addition of an advanced function that allows searching for fuzzy and phonetic terms. The tool will be integrated into WIPO GOLD, which provides quick and easy on-line access to a broad collection of searchable IP data and tools relating to, for example, technology, brands, designs, statistics, WIPO standards, and international classification systems. The Georgian Patent Office has distributed the discount on official fees in the amount of 70% on the international applications and patents filed and owned by applicants who are inventors and designers. The discount shall be applied for all fees for patenting of an invention, utility model and design. Moreover, the discount shall be applied even for already granted patents and for pending applications filed after July 3, 2010. Official fees for applications filed before July 3, 2010 shall be paid in full amount, however after the patent is granted annuities may be paid in the amount of 30% of the amount of corresponding annual fee. On February 10, 2011 a draft law on introducing amendments to the Patent Law of Estonia was submitted to the parliament for ratification. The key change in the amendments to the Patent Law is that the Estonian Patent Office will start conducting prior art searches to determine the novelty of patents for which utility model registration is sought. This service will be free of charge and it will not affect the duration of the registration procedure. Another new feature in the amendments is a new type of license called “simple public license”. The owner of a utility model who does not intend to use his invention may release a notification in the Official Gazette stating that his utility model may be used within Estonia by anyone who pays the corresponding license fee. Since 2011 the Lithuanian State Patent Bureau has launched a patent database on its website, in Lithuanian and English. This database shall comprise the descriptions of patent applications published in the 2011 Official Bulletin No.1 and in the subsequent issues. The database will also contain the descriptions of all patents issued in accordance with the Patent Law of the Republic of Lithuania. Lithuanian online patent database can be found on the website of the State Patent Bureau http://www.vpb.lt/index.php?l=lt&n=140. On February 1, 2011 the Verkhovna Rada of Ukraine adopted in the first reading the bill No. 6523 on amendments of some legislative acts of Ukraine on regulations of copyright and related rights, in particular in the field of collective management of property rights. • implementing an effective campaign against Internet piracy. The bill No. 6523 received support of the International Federation of the Phonographic Industry (IFPI). Moreover several provisions of the bill were proposed by the most influential international organization in this sphere – the International Intellectual Property Alliance (IIPA). Ukrainian writers, performers and producers are acting in favor of the bill No. 6523 which will bring Ukraine closer to the international standards in the field of intellectual property protection. Improvement of the legislation and qualitative changes in the field of copyright and related rights are to stimulate development of the Ukrainian music industry where authors and artists will be able protect their works from illegal use and create high-quality musical product. On February 3, 2011 the Decree № 1824 of the Council of Ministers of the Republic of Belarus of December 15, 2010 "On Approval of Regulations on extension of patents for inventions, utility models and industrial designs" came into force. The decree stipulates approval of the procedure of extending the validity term of invention patents, utility models, industrial designs, which is designed in accordance with the existing enforcement practices related to the extension of the validity of the above-indicated patents and is aimed at improving thereof. The decree also set requirements that are applied for the request for renewal of patent for invention, utility model or design, a list of data the above-indicated requests for renewal should contain, the order of proceedings when they are considered in the Patent Office and issuance of decision by the Patent Office on the results of the consideration. In accordance with Item 2 of the decree the State Committee on Science and Technology is authorized to develop and approve the request forms for the extension of the patent, utility model and design. On January 1, 2011 the amendments to the Civil Procedure Law came into effect in Latvia, increasing the amount of the official fees for filing a court action in IP infringement and protection matters. The official fee for filing such action has increased three times and now amounts 150 lats (earlier 50 lats). Accordingly, the fee for filing an appeal against the judgment of the first court instance has also increased from 25 lats to 75 lats, as well as the amount of fee for filing a writ of appeal has changed from 50 lats to 200 lats. Besides, as of January 1, 2011 the amendments to the Criminal Law and the Administrative Violations Code relating to the responsibility for infringing intellectual property rights have entered into force. In conclusion, it is expected that as of January 1, 2012, a new Law on Industrial Property is to come into force in Latvia. • The first one is the Law on Ratification of the Patent Law Treaty (PLT). The Patent Law Treaty (PLT) is a patent law multilateral treaty concluded by 53 States and the European Patent Organisation (an intergovernmental organization) on June 1, 2000 in Geneva, Switzerland. Its aim is to harmonize formal procedures, such as the requirements to obtain a filing date for a patent application, the form and content of a patent application, as well as representation. • The second one is the Law on Introducing Amendments to Intellectual Property Legislation of the Republic of Kazahstan. The amendments to IP legislation are aimed at eliminating inner contradictions, legislative recognition of the status of patent attorneys, as well as the reduction of terms for examination of application for subjects of industrial property. Within the scope of execution of the project “Complex of software tools for preparing the materials for examination and registration of trademarks” there has been developed the software ARM Registrar, a part of the set of software tools to automate the preparation of electronic materials sent for examination and registration of trademarks in the Russian Federal Institute of Industrial Property. The software is designed to enhance the effectiveness in submission of the application information with the Russian Federal Institute of Industrial Property for subsequent examination and registration of trademarks on the basis thereof. It is also designed to automate the process of receiving by the applicant or his representative correspondence relating to the registration procedure (requests, notifications, decisions and other documents) issued by the Russian Federal Institute of Industrial Property. - accessing the International Standard Classification of Goods and Services (ICGS). - accessing incoming documents, directed from the Russian Federal Institute of Industrial Property; etc. - to install both the electronic digital signature key and the software on the computer. Meanwhile, in January 2011 the Russian Federal Institute of Industrial Property is to put into operation the trial automated system of paperless persecution of patent applications, i.e. software for electronic filing of invention applications.